Gung Haggis dragon boat team performs better than expected, coming 2nd and a close 3rd at Taiwanese Dragon Boat races. Gung Haggis Fat Choy dragon boat team did really well today at the Vancouver Taiwanese Dragon Boat Races, held at Plaza of Nations with the Taiwanese Cultural Festival. Colleen was our flag grabber. Wendy and Alissa are doing lead stroke. Hillary and Jane in second seat. Cindy and Brooke in 3 seat. Rounding out the team is Stephen, Jim, Tony, Jonas, Devon, Sher, Raphael, Stuart, Joe. Joining us for the day is Judi, Lee (from Sudden Impact Black – who paddled with Dave in Australia last year) + Karl (who is joining us from the Killarney junior team.). drummed by our friend Patrick Couling. Scotiabank Dragons is a veteran team with lots of experienced paddlers. Dan Seto paddled with Gung Haggis for 3 years, but he joined Scotiabank this year to push him self more on a competitive team that went to Comp B at the Rio Tinto Alcan dragon boat festival this year. I know lots of other paddlers on the team such as Elias whom I paddled with in 2001 on the GM team, steers William whom I coached in 2001 for the Civil Serpents team, Connie whom I sometimes work with at the Vancouver Public Library and got to know on the strike line last fall. For the Taiwanese dragon boat races. You have to grab the flag before you cross the finish line. Dragon Boat racing has its origins in ancient China, in 299 BC, long before there were stop watches. The early race winners were determined by which team grabbed a flag first. On our modern day race course in Vancouver's False Creek, there is a strong current and the channel is deep, so exact placement of flags is impossible. For the Vancouver Taiwanese Dragon Boat Races, each team must grab a flag, keep paddling, then cross the finish line, which is approximately at the second set of buoy markers. The flag can only be grabbed by the designated flag grabber. If the flag grabber misses the flag, the boat must stop and go back for the flag. If a paddler grabs the flag, the team can be disqualified. As we approached the flag, our designated flag grabber Colleen got ready. I called a race finish, and Colleen stood up behind the large dragon head that is a feature on these Taiwanese dragon boats. She guided our steers to the flag by pointing with her outstretched arms. Dave aimed the dragon boat to the flag. Colleen is right handed, but instead of bringing the boat to the left of the flag, we were heading to the right side of the flag. Colleen reached out her left hand and easily grabbed the flag. Colleen is a rookie dragon boater who joined our team this spring. She discovered our team through our website www.gunghaggisfatchoy.com when she googled “Vancouver” and “dragon boat”. Her ethnic heritage includes some Scottish ancestry, so she was intrigued. She was really enjoyed paddling with the team and brought her girlfriend Alissa along with her to our early spring practices in March. One of Colleen and Alissa's favorite team activities is joining the “Gung Haggis foodie club” after practice and going to replenish carbohydrates at a local restaurant. away from them so fast. We came second in our first race at 10am, Scotiabank came first. come in wider, like a skier in slalom gates and cut the exit tighter. Having friends on different dragon boat friends really adds to the social cameraderie of the dragon boat races. Bernie, Joanne, Tori and myself have known each other since around 2000 or 2001. I regard Patrick Couling as one of my early dragon boat mentors who I have known since 1997. James Yu was steers on my first dragon boat team in 1997, and he first taught me to steer in '98. James is helping out with the water crew for the race organizing and officiating. On the water, the kibbitzing stopped as the wind made it challenging to line up the boats for the starting position. The boats are backed into the Pier north of Science World. The steersperson grabs a rope tether beneath a lane number. This is supposed to give each team an aproximate but equal position at the start line. But the wind was pushing all the teams southward. If the steers is holding the tether, than it anchors them to the dock and the bow of the boat moves South. The front right side paddlers have to draw to keep the boat lined up straight. We were trying to do this, while stay ready for the race start. we make 2nd place again? Stuart Mackinnon was our flag grabber, and he did an excellent job. Stuart joined the Gung Haggis team last year. He loved dragon boating so much he was inspired to start up the Killarney Cougar Dragons, at Killarney Secondary School where he teaches. As we approached the finish line, Stuart stood up and reached his arm out for the flag. Dave steered our boat to the left of the flag, right into Stuart's right hand. The team kept paddling to the finish line. this year, as they have been doing lots of outrigger paddling. The team is performing so well, they almost don't need coaching. Everybody is paddling hard and deep, and getting a good reach. Our first race is 11am on Sunday…. then we are in the finals…. 3:55 Race # 28 Group A Medal Final – Wow… in our dreams… we aspire to greatness. We were set up today in the trees straight ahead – south of the porta-potties. Look for the 4' X 2' sign Gung Haggis Fat Choy dragon boat team. Red letters on white sign. This entry was posted in Dragon Boat Information, Dragon Boat photos 2003, Dragon boat with Todd Wong - Dragon Boat Coach, Gung Haggis dragon boat team information, Main Page on August 31, 2008 by Todd. Taiwanese Dragon Boats are beautiful. Gung Haggis Fat Choy dragon boat team's first race is 11am. Nations. Come to Cooper's Park – West of the Cambie St. Bridge. The Sea Walk is NOT closed. But Plaza of Nations will be gated off. Taiwanese Cultural Festival http://ww.taiwanfest.ca is about $10-$12 for admission. It has been voted best cultural festival many times. 12:55 pm Barrel Race # 5 This is where we take the dragon boat for 3 turns with only 10 paddlers. This entry was posted in Dragon Boat Information, Dragon Boat photos 2003, Dragon boat with Todd Wong - Dragon Boat Coach, Gung Haggis dragon boat team information, Main Page on August 30, 2008 by Todd. “Justice Rocks” is highlighting music and social activism at Strathcona Park on Saturday June 30th. “Justice Rocks” is a FREE one-day concert in East Vancouver's Strathcona Park. 12 noon to 8pm features live music. Curtis Santiago, Fur Bearing Animals, Run GMC and more! Justice Rocks will be a family oriented outdoor event with activities during the day, and will offer a 'Kidz Zone', including a shaded child-oriented rest area, face painting, big bubbles, story-time hosted by children's librarians from the Vancouver Public Library, crafts and cooperative games for children of all ages. Justice Rocks is a break-even event. All proceeds raised will go exclusively to paying the costs of event production, with any profits going towards the costs of Justice Rocks 2009. If you have a question regarding Justice Rocks or would like to get involved, give us a shout! You can call us at Pivot Legal Society at (604) 255-9700. Ask to speak to Michaela Montaner (ext.105) or John Richardson (ext.110). This entry was posted in Main Page, Upcoming Events on August 30, 2008 by Todd. Joy in Cambodia: Postcard #2 What does a Canadian do? Joy Singbeil (far right) back in June at the Rio Tinto Alcan Dragon Boat Festival with team mates Joe Easton (left) and Marion Hoy (centre). But now she is in Cambodia… teaching drama?!?!? photo courtesy of Marion Hoy. $4.00 bu the locals flip back and forth from one currency to another. our tuktuk………very few people have helmets. the local children who came to visit us and helped us cook on our BBQ. I can't eat but for the most part food here is great and very cheap. city waking up and looked over at the breakfast being cooked below me. students are very ESL but very bright and willing for the most part. to get all the colours of the rainbow done before I leave. look for another lovely(cheaper) place. Love to all……….please pass this along to any other interested soul. This entry was posted in Cultural Fusion, Main Page, Travel reports on August 28, 2008 by Todd. 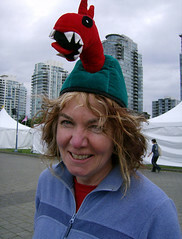 Joy Singbeil is a Gung Haggis dragon boat team member. She is in Cambodia for 2 years on teaching assignment. this is her first travel report. all of you in one lucky go. So what to say so far… Today is the 3 week anniversary of my arrival. back of a motor bike. Every step into the street has an adventure. card you might be able to reach me. was so noisy I couldn't hear myself or the other person. Yesterday I went on the Hash House Harriers Run out into the country. kinds of good food and beer. affection and love. They made me cry. They proudly showed us around. them this Tuesday and then perhaps for a lot longer. road and hid under a car. This entry was posted in Main Page, Travel reports on August 28, 2008 by Todd. The Vancouver Taiwanese Dragon Boat Races are one of our team's favorite races. We have race every year, since the inaugural race in 2003. It runs in conjunction with the Taiwanese Cultural Festival, which is an amazing festival featuring Taiwanese food, culture, music and arts. It takes place at Plaza of Nations, August 30, 31 and September 1, over the Labour Day weekend. We met at Dragon Zone as usual for our Tuesday 6pm practice. A few paddlers were standing outside when I arrived, but because it was raining – we went inside the trailer / clubhouse. Inside we found more team mates. We did a briefing there… as we waited for latecomers. Many of the new paddlers hadn't been on a Taiwanese boat before, and they had missed our Sunday practice (because of the rain), so this practice was important to help get our paddlers used to the Taiwanese boats. “tethered race start”, then did a full race piece to Plaza of Nations. we practiced the “clover-leaf turns” for the “barrel race”. Despite the rain, we had fun. The turns take a lot out of you, and our paddlers were tired. We returned the Taiwanese boat, climbed back into the Gemini, then returned to Dragon Zone. But, we did another race start and a short race piece back towards Dragon Zone. We are hoping the weather will be drier on the weekend. We managed all spring and summer to have very few rainy practices, and now we are getting drenched every time we go out in a boat. This entry was posted in Dragon Boat photos 2003, Dragon boat with Todd Wong - Dragon Boat Coach, Gung Haggis dragon boat team information, Main Page on August 28, 2008 by Todd. We would like all Taiwanese rostered paddlers at practice TUESDAY night (except Tzhe in Hong Kong and Dave). All paddlers are welcome… hopefully we will have enough for two boats…or at least 18 paddlers for Taiwanese boat. go out because we didn't have enough paddlers show up. worried about the mental resolve of rain-scaredy paddlers! goodness we had the magic number 10 paddlers + steers. the water so we all had longer 48″ paddles (blue). arm to keep the paddle vertical. paddlers we didn't have the strength to make it fly. very impressive. Looks like lots of fun for this coming weekend. + Karl 1 + 2 more paddlers? This entry was posted in Dragon Boat photos 2003, Dragon boat with Todd Wong - Dragon Boat Coach, Gung Haggis dragon boat team information, Main Page on August 25, 2008 by Todd. In memoriam: Betty Ho goes to that big kitchen in the sky. Betty Ho had a love of life that was big. It was so big, that when she retired – she kept living large. Betty went to Simon Fraser University. She volunteered at festivals. And she made big contributions to her church group, Vancouver Chinese Presbyterian Church. Last year, she joined the Chinese Canadian Historical Society writing workshop last year, facilitated by Brandy Lien-Worrall. That was how I met her. Here is our entire writing group at the official book launch at the Vancouver Museum on Nov. 25th. Betty also had a love for Chinese Canadian history, arts and culture. Last year I saw her at the book launch of Jade Rubies, written by my cousin Valerie Wong. The last time I saw Betty was earlier this year when our writing group had an “Iron Chef” styled cook-off between the two writing groups. Each group was told to cook with yams. We could make desserts, main courses, appetizers, salads… anything… as long as it contained yams. Betty really enjoyed the evening. Each group was invited to have members go up to the microphone and make “verbal contributions.” Betty sent her son Arnie as her envoy. Despite her incredible zest of life, and her openness to share her stories through her writing, she could still be shy. Sad news. Betty passed away Sunday August 10. A service will be held Friday August 15 at Ocean View Funeral Home at 1 pm. At Betty's request, please wear attire to reflect her zest for life (do not wear black). A Celebration of Life will be held Saturday, August 16 2pm at the Vancouver Chinese Presbyterian Church, 6137 Cambie Street. In lieu of flowers, donations can be made “In Memory of Betty Ho” to the BC Cancer Foundation, Suite 600-686 W. Broadway, Vancouver, B.C. V5Z 1G1 or to P.W.S. & D, c/o of The Chinese Presbyterian Church. Here is the obituary that appeared in the Vancouver Sun and Vancouver Province. & Aboriginal Potluck”. Betty loved travel, photography and music. volunteering at both the Jazz and Folk Festivals. She was faithful servant at The Vancouver Chinese Presbyterian Church. 2:00pm at The Vancouver Chinese Presbyterian Church (6137 Cambie Street). This entry was posted in Main Page on August 24, 2008 by Todd. Vancouver Sun: Kerry Jang asks 'Does housing first' model make sense? Kerry Jang looks for a more comprehensive solution to solving Vancouver's homelessness and drug addiction problems. Dr. Kerry Jang has written a op-ed piece for the Vancouver Sun about the “not so simple”solutions for solving homelessness in Vancouver. his research on mental illness to problems in his community of Collingwood in Vancouver. And… he wants to be a Vancouver city councilor for Vision Vancouver. In 2006, he was named academic of the year by receiving the 2006 CUFA/BC Distinguished Academics Awards. I really appreciate his work in the mental health field. Back in 2001, I did a co-op work study with the Canadian Mental Health Assocation, BC Division. I got to understand a lot more about the issues, as I worked on community projects. Most importantly, I worked on a lobby campaign to highlight mental health issues for that fall's provincial election. Kerry has served as both volunteer and board member for the Canadian Mental Health Association, but more recently he serves on the newly created Mental Health Commission of Canada. I first met Kerry a few years ago at a fundraiser for Jenny Kwan. In the years since, we have gotten to know each other, trade advice, and greet each other warmly. When it was my turn this year to go to Victoria and receive my BC Community Achievement Award, I asked about the event, and Kerry gave me fashion advice, and suggested that I wear my kilt. A few weeks ago, Kerry asked me for an endorsement for his website. Earlier this month, both Jang and Andrea Reimer created a news event by soliciting skytrain riders to apply for the vacant Translink board positions. It was a very good and effective political publicity stunt, while addressing the problems of Translink's financial and undemocratic issues. I heard Kerry speaking on CBC radio, and Frances Bula wrote it up on her blog. Does 'housing first' model make sense? housing in single-room occupancy (SRO) hotels. begin to address their mental illness and/or drug addiction problems. Who is right? Should we be smiling or hanging our heads in shame? problems of mental illness, addiction and homelessness. problems, no matter how big or small they may be. person a leg up so they can move on to appropriate treatment. the “hierarchy of needs” outlined by the psychologist Abraham Maslow. acceptance of facts — until the each of the lower levels have been met. addiction so that they could go into housing. 1990s with the closure of Riverview Psychiatric Hospital. This entry was posted in Commentaries, Main Page, politics and politicians on August 23, 2008 by Todd. Gung Haggis dragon boat team gets ready for Vancouver Taiwanese Dragon Boat races. 6th Annual Vancouver Taiwanese Dragon Boat Races is coming up on August 30/31 Labour Day weekend…. and Gung Haggis dragon boat team will be ready! It is the last Sunday before Vancouver Taiwanese dragon boat races on August 30/31. held in conjunction with Taiwanese Cultural Festival held at the Plaza of Nations. We had a FANTASTIC practice on Tuesday night. Stephen Mirowski said he hasn't felt power in the boat like this since Vernon. The boat actually surged during power series. with good support from Gerard, Karl and Brooke. We did some race pieces + practiced fun race elements such as the “seat switcheroo” for the NOGARD (backward) race + “turns” for the barrel race. Everybody said it was a good practice. Only 2 more practices before Taiwanese races… and the pressure to perform is on! It's always interesting how more focussed the team and practices are just before a race event. Our roster is still to be settled. Unfortunately, a number of Gung Haggis paddlers have some vacation and work commitments. Well maybe… GVRD has usually been James was impressed with Tuesday's boat, and said Gung Haggis should be better than GVRD next year.much stronger than us at practice races prior to Alcan festivals over the past few years. We finally actually beat them during one practice this year, but lost all others. This entry was posted in Main Page on August 23, 2008 by Todd.